Two X-29 aircraft, featuring one of the most unusual designs in aviation history, were flown at the NASA Ames-Dryden Flight Research Facility (now the Dryden Flight Research Center), Edwards, Calif., as technology demonstrators to investigate advanced concepts and technologies. The multi-phased program was conducted from 1984 to 1992 and provided an engineering data base that is available in the design and development of future aircraft. The X-29 almost looked like it was flying backward. Its forward swept wings were mounted well back on the fuselage, while its canards – horizontal stabilizers to control pitch – were in front of the wings instead of on the tail. The complex geometries of the wings and canards combined to provide exceptional maneuverability, supersonic performance, and a light structure. 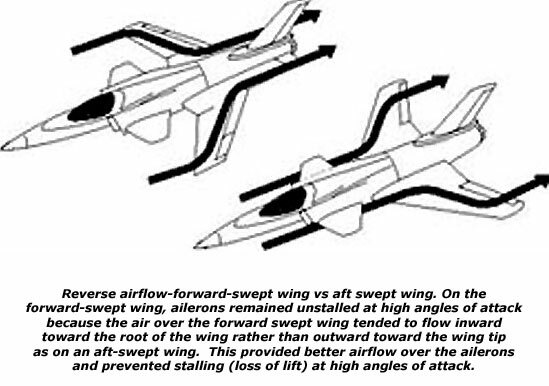 Air moving over the forward-swept wings tended to flow inward toward the root of the wing instead of outward toward the wing tip as occurs on an aft swept wing. This reverse air flow did not allow the wing tips and their ailerons to stall (lose lift) at high angles of attack (direction of the fuselage relative to the air flow). 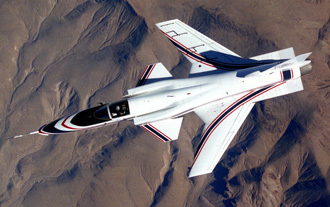 The concepts and technologies the fighter-size X-29 explored were the use of advanced composites in aircraft construction; variable camber wing surfaces; the unique forward-swept wing and its thin supercritical airfoil; strake flaps; close-coupled canards; and a computerized fly-by-wire flight control system to maintain control of the otherwise unstable aircraft. 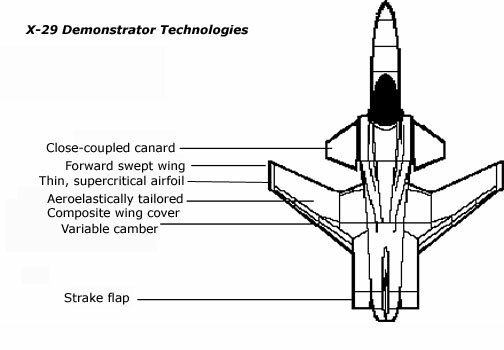 Research results showed that the configuration of forward swept wings, coupled with movable canards, gave pilots excellent control response at up to 45 degrees angle of attack. During its flight history, the X-29s were flown on 422 research missions – 242 by aircraft No. 1 in the Phase 1 portion of the program; 120 flights by aircraft No. 2 in Phase 2; and 60 flights in a follow-on « vortex control » phase. An additional 12 non-research flights with X-29 No. 1 and 2 non-research flights with X-29 No. 2 raised the total number of flights with the two aircraft to 436. Before World War II, there were some gliders with forward-swept wings, and the NACA Langley Memorial Aeronautical Laboratory, Hampton, Va., did some wind-tunnel work on the concept in 1931. Germany developed a motor-driven aircraft with forward-swept wings during the war known as the Ju-287. 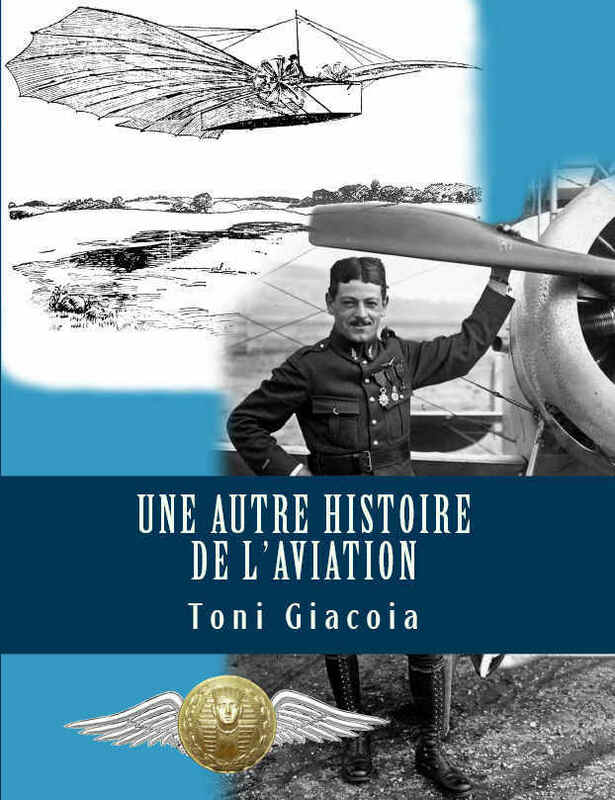 The concept, however, was not successful because the technology and materials did not exist then to construct the wing rigid enough to overcome bending and twisting forces without making the aircraft too heavy. The introduction of composite materials in the 1970s opened a new field of aircraft construction, making it possible to design rugged airframes and structures stronger than those made of conventional materials, yet lightweight and able to withstand tremendous aerodynamic forces. Construction of the X-29’s thin supercritical wing was made possible because of its composite construction. State-of-the-art composites permit aeroelastic tailoring, which allows the wing some bending but limits twisting and eliminates structural divergence within the flight envelope (i.e., deformation of the wing or breaking off in flight). In 1977, the Defense Advanced Research Projects Agency (DARPA) and the Air Force Flight Dynamics Laboratory (now the Wright Laboratory), Wright-Patterson Air Force Base, Ohio, issued proposals for a research aircraft designed to explore the forward swept wing concept. The aircraft was also intended to validate studies that said it should provide better control and lift qualities in extreme maneuvers, and possibly reduce aerodynamic drag as well as fly more efficiently at cruise speeds. From several proposals, Grumman Aircraft Corporation was chosen in December 1981 to receive an $87 million contract to build two X-29 aircraft. They were to become the first new X-series aircraft in more than a decade. First flight of the No. 1 X-29 was Dec. 14, 1984, while the No. 2 aircraft first flew on May 23, 1989. Both first flights were from the NASA Ames-Dryden Flight Research Facility, later renamed the Dryden Flight Research Center. The flight control surfaces on the X-29 were the forward-mounted canards, which shared the lifting load with the wings and provided primary pitch control; the wing flaperons (combination flaps and ailerons), used to change wing camber and function as ailerons for roll control when used asymmetrically; and the strake flaps on each side of the rudder that augmented the canards with pitch control. The control surfaces were linked electronically to a triple-redundant digital fly-by-wire flight control system (with analog back up) that provided an artificial stability. 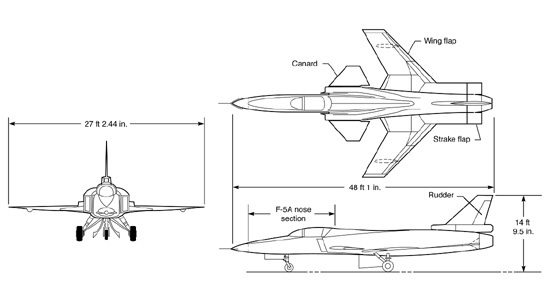 The particular forward swept wing, close-coupled canard design used on the X-29 was unstable. The X-29’s flight control system compensated for this instability by sensing flight conditions such as attitude and speed, and through computer processing, continually adjusted the control surfaces with up to 40 commands each second. This arrangement was made to reduce drag. Conventionally configured aircraft achieved stability by balancing lift loads on the wing with opposing downward loads on the tail at the cost of drag. The X-29 avoided this drag penalty through its relaxed static stability. Each of the three digital flight control computers had an analog backup. If one of the digital computers failed, the remaining two took over. If two of the digital computers failed, the flight control system switched to the analog mode. If one of the analog computers failed, the two remaining analog computers took over. The risk of total systems failure was equivalent in the X-29 to the risk of mechanical failure in a conventional system. The No. 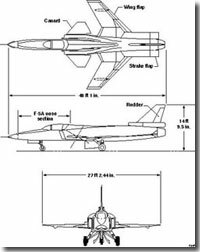 1 aircraft demonstrated in 242 research flights that, because the air moving over the forward-swept wing flowed inward, rather than outward as it does on a rearward-swept wing, the wing tips remained unstalled at the moderate angles of attack flown by X-29 No. 1. Phase 1 flights also demonstrated that the aeroelastic tailored wing did, in fact, prevent structural divergence of the wing within the flight envelope, and that the control laws and control surface effectiveness were adequate to provide artificial stability for this otherwise extremely unstable aircraft and provided good handling qualities for the pilots. The aircraft’s supercritical airfoil also enhanced maneuvering and cruise capabilities in the transonic regime. Developed by NASA and originally tested on an F-8 at Dryden in the 1970s, supercritical airfoils – flatter on the upper wing surface than conventional airfoils – delayed and softened the onset of shock waves on the upper wing surface, reducing drag. The phase 1 flights also demonstrated that the aircraft could fly safely and reliably, even in tight turns. The No. 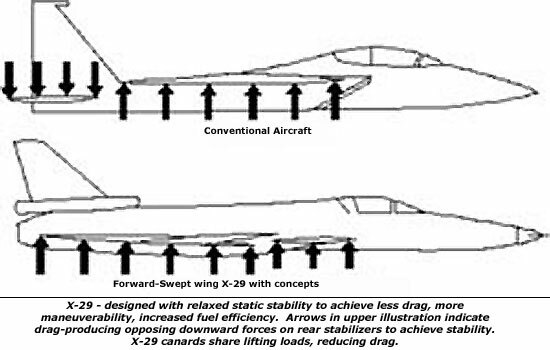 2 X-29 investigated the aircraft’s high angle of attack characteristics and the military utility of its forward-swept wing/canard configuration during 120 research flights. In Phase 2, flying at up to 67 degrees angle of attack (also called high alpha), the aircraft demonstrated much better control and maneuvering qualities than computational methods and simulation models had predicted. The No. 1 X-29 was limited to 21 degrees angle of attack maneuvering. During Phase 2 flights, NASA, Air Force, and Grumman project pilots reported the X-29 aircraft had excellent control response to 45 degrees angle of attack and still had limited controllability at 67 degrees angle of attack. This controllability at high angles of attack can be attributed to the aircraft’s unique forward-swept wing- canard design. The NASA/Air Force-designed high-gain flight control laws also contributed to the good flying qualities. Flight control law concepts used in the program were developed from radio-controlled flight tests of a 22-percent X-29 drop model at NASA’s Langley Research Center, Hampton, Va. The detail design was performed by engineers at Dryden and the Air Force Flight Test Center at Edwards Air Force Base. The X-29 achieved its high alpha controllability without leading edge flaps on the wings for additional lift, and without moveable vanes on the engine’s exhaust nozzle to change or « vector » the direction of thrust, such as those used on the X-31 and the F-18 High Angle-of-Attack Research Vehicle. Researchers documented the aerodynamic characteristics of the aircraft at high angles of attack during this phase using a combination of pressure measurements and flow visualization. Flight test data from the high-angle-of-attack/military-utility phase of the X-29 program satisfied the primary objective of the X-29 program – to evaluate the ability of X-29 technologies to improve future fighter aircraft mission performance. 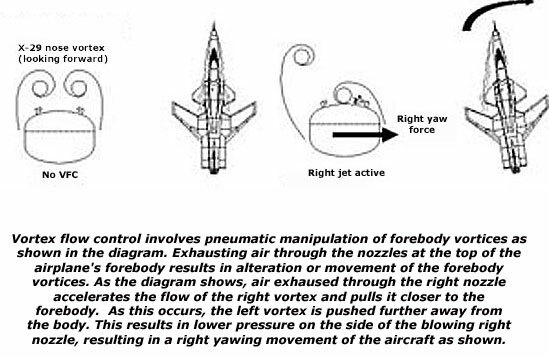 In 1992 the U.S. Air Force initiated a program to study the use of vortex flow control as a means of providing increased aircraft control at high angles of attack when the normal flight control systems are ineffective. The No. 2 X-29 was modified with the installation of two high-pressure nitrogen tanks and control valves with two small nozzle jets located on the forward upper portion of the nose. The purpose of the modifications was to inject air into the vortices that flow off the nose of the aircraft at high angles of attack. Wind tunnel tests at the Air Force’s Wright Laboratory and at the Grumman Corporation showed that injection of air into the vortices would change the direction of vortex flow and create corresponding forces on the nose of the aircraft to change or control the nose heading. From May to August 1992, 60 flights successfully demonstrated vortex flow control (VFC). VFC was more effective than expected in generating yaw (left-to-right) forces, especially at higher angles of attack where the rudder loses effectiveness. VFC was less successful in providing control when sideslip (relative wind pushing on the side of the aircraft) was present, and it did little to decrease rocking oscillation of the aircraft. design with forward-swept wings could not yield a reduction in drag. Overall, the X-29 program demonstrated several new technologies as well as new uses of proven technologies. These included: aeroelastic tailoring to control structural divergence; use of a relatively large, close-coupled canard for longitudinal control; control of an aircraft with extreme instability while still providing good handling qualities; use of three-surface longitudinal control; use of a double-hinged trailing-edge flaperon at supersonic speeds; control effectiveness at high angle of attack; vortex control; and military utility of the overall design. The X-29 is a single-engine aircraft 48.1 feet long. Its forward-swept wing has a span of 27.2 feet. Each X-29 was powered by a General Electric F404-GE-400 engine producing 16,000 pounds of thrust. Empty weight was 13,600 pounds, while takeoff weight was 17,600 pounds. The aircraft had a maximum operating altitude of 50,000 feet, a maximum speed of Mach 1.6, and a flight endurance time of approximately one hour. The only significant difference between the two aircraft was an emergency spin chute deployment system mounted at the base of the rudder on aircraft No. 2. External wing structure is primarily composite materials incorporated into precise patterns to develop strength and avoid structural divergence. The wing substructure and the basic airframe itself is aluminum and titanium. Wing trailing edge actuators controlling camber are mounted externally in streamlined fairings because of the thinness of the supercritical airfoil.